This week, PLoS Medicine published the fifth of five Policy Forum articles focused on integrating mental health care into other health care platforms (e.g. maternal and child health, HIV, NCDs). Shared by Bola Ola, collaborative member of the Gulbenkian Global Mental Health Platform. Launching in June, 2013, The Lancet Global Health will publish original research, commentary, correspondence, and blogs on any aspect of global health, and offer readers unrestricted access to all content. The Indian Government announced an ambitious child-health screening initiative that will run nationally, covering 270 million children, The Lancet reports. The 5th World Congress on Women's Mental Health highlighted the current hot issues in this field. Shared by Marta Rondon, collaborative member of the Gulbenkian Global Mental Health Platform. 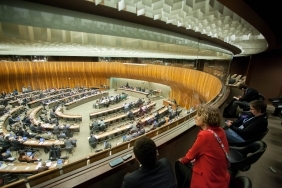 Friday, 24 May 2013 – The Health Assembly approved a resolution on WHO’s comprehensive mental health action plan 2013-2020 – the first action plan on mental health to have been put forward by WHO.